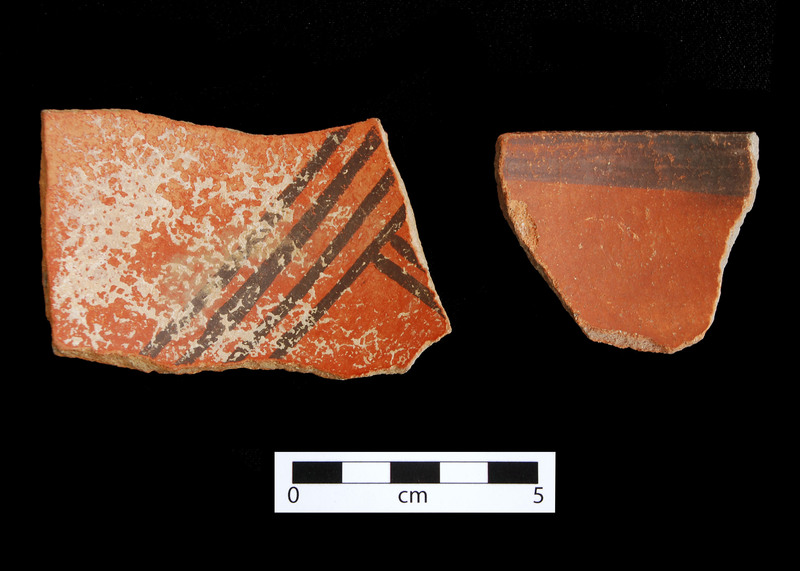 Deadmans Black-on-red bowl sherds (interior). Click the image to open the Deadmans Black-on-red gallery. Deadmans Black-on-red is a type of San Juan Red Ware most commonly found in northern Arizona east of the Colorado River. Date Range: Kayenta Heartland: A.D. 780-1040 (Christenson 1994); Flagstaff Region: A.D. 750-1075 (per Christian Downum, Northern Arizona University). Core Color: Dark gray to gray, dark brown to brick-red. Temper: Rock, angular quartz, lesser amounts hornblende, or basalt; conspicuous in cross section of reddish color; not conspicuous on surfaces. Surface Finish: Bowls not bumpy highly polished; horizontal polishing marks frequently conspicuous; both surfaces of bowls and exterior of jars are compacted. Slip present. Surface Color: Red, reddish brown, interior surface of seed jars is light brownish-gray, surface color and core do not contrast when core is reddish. Forms: Bowls predominate, dippers rare, seed jars uncommon, jars rare. Vessel Thickness: 2 to 6.4 mm, average 3.8 mm; walls uniform in thickness (bowls); 2.4 to 5.4 mm; average 4 mm (seed jars); 3.2 to 6.7 mm; average 5 mm (jar walls). Paint: Black, brown, purplish; frequently crystals show in paint. Design: Interior surface of bowls, rarely exterior, rims occasionally painted; exterior surface of jars. Geometric, 1 to 4 encircling lines beginning at base of rim; often motifs pendent from rim; lines: stripes, solid triangles; lines: straight, wavy, single or in series. Comparisons: Bluff Black-on-red less highly polished; somewhat bumpy; pitted; bowl walls thicker; crudely executed; encircling line below rim absent; elements often arranged in circular order; curved lines and stripes common. Other Names: Red ware with shiny paint.